What does it Really mean to be FOCUS? 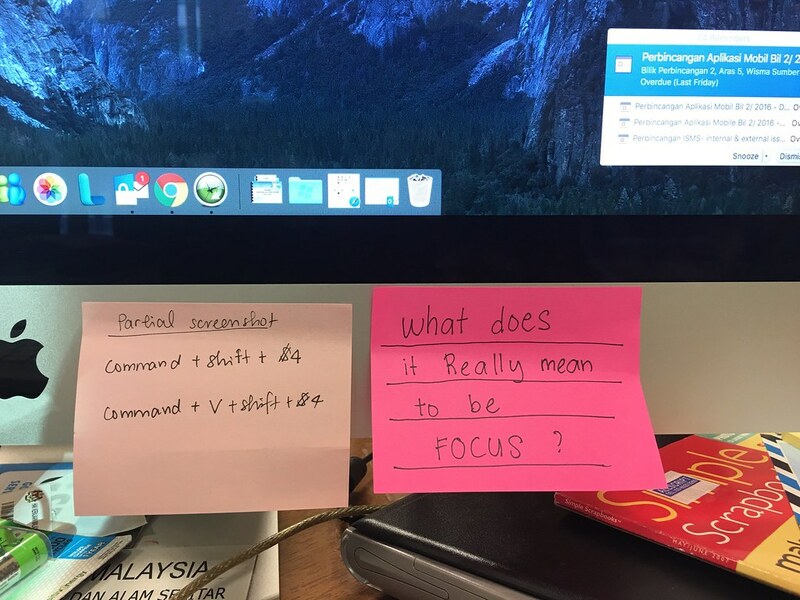 I put this sticky note at work on my iMac. I wanted to be reminded about my word this month during my eight hours away from home. I used to love my job but after being here for twenty years, I really need to hit a pause button, readjust my FOCUS and rediscovered why I love my job in the first place. After a few weeks of self assessment I realised that back in the days, life was simple, internet and technology were unknown territory. Being in IT world has the advantages because we set the tone. We showed what can be accomplished when one computer connected to the internet. How fast we can communicate with each other via email. How fast we can typed a report and minutes meeting in a day. Do it yourself mentality started to grow at the office. Fast forward to twenty years later, every person in the office has a device a.k.a smart phone that connected to the internet all the time. Information at your finger tips. Almost everyone can create content. People are not scared to hold a mouse anymore. So what's left for people like me (the IT people)? Evolve and adapt perhaps? Are we still relevant? I realised that lately "The Management" didn't see us as relevant anymore. Maybe they believe that they know everything there is to know about IT world or maybe they can't really process the things that they cannot see. There's no more IT Project, there's only Business Project. IT has become the tool, the enabler, no longer the drive. What does this mean to me? During my one little word journey this year, I discovered that in order for me to stay current and relevant, I need to be a solution specialist. People still need to do their work, people has all the tools available to them, which can be overwhelming, to do their work. So it is up to me and my team to guide and help them to do their work more effectively. Just by exploring this new idea and role has managed to make me feel excited with my job again. I have always love technology and I love discovering what these technologies can do to improve my life and help me be more productive. So I am giving FOCUS a new meaning in terms of work. I am loving this month assignment, getting connected with my word. I really like Ali Edwards idea of converting ideas into something tangible. Just by writing down a question "What does it really mean to be FOCUS" on a sticky note and put them every where that you can see regularly. The idea is to be a visual reminder of your word and answer them , write down your response.